That can certainly be applied to preparing for a new puppy, which is why we’ve put together a new puppy checklist for your new pet parents! 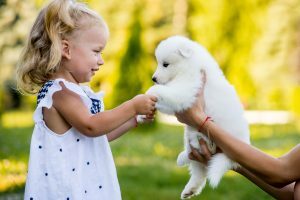 Here are some “bringing home a new puppy” tips that you’ll need to make your house a home for your new furry baby. Your new puppy will undoubtedly have lots of energy so you want to make sure that you select bowls that are sturdy and can withstand potentially being knocked over a time or two. Stainless steel bowls are really good because they are easy to clean and don’t hold germs the way that plastic bowls do. In the beginning, you want to get small bowls to accommodate your small puppy. As she ages, you can get larger ones, depending on the breed. The first year of your puppy’s life is essential, which is why their nutritional development is crucial during the first year. During this time, your puppy needs specific nutrition that’s going to promote strong bones. Start your puppy on the right track with healthy, non-fatty, puppy food. Your puppy needs a collar or harness to hang her ID and rabies tags. Ideally, it should be lightweight and nylon and have some sort of reflective lighting on it, for evening walks. It almost goes without saying that a leash is necessary too. You can get fancy if you’d like because there are tons of styles and colors from which you can choose! Make every step as fun as possible. But of course, you want your puppy to be cute at all times! As much as it may seem trivial, grooming supplies are necessary and should be added on the new puppy checklist. The type of brush and comb you select should be in line with the type of breed you have and the natural texture and length of their hair. Regardless of the type, we do, however, recommend purchasing a flea comb as well as one of our “bringing home a new puppy” tips. Just like with kids, toys are fun and definitely worth a purchase. Your puppy is just a baby, so she’ll need a few things to occupy her time and to keep your furniture intact! Toys help to curb destructive behavior for dogs. Make sure that you get age-appropriate toys and ones that are for their tender baby teeth. Don’t get toys that are too small and can be accidentally swallowed. As general rules, follow the below “don’ts” as they relate to purchasing toys. Never give your puppy socks, shoes, or personal clothing to play with because they’ll think it’s okay. Never give your puppy toys that are made of soft fur, rubber, wool, sponge, or plastic. They are severe choking hazards. Never give your puppy anything that’s hard with sharp objects. Never give your puppy yarn, plastic wrap, twist ties, balls of string, or plastic baggies. Your puppy will need a warm, comfortable place to sleep and crates provide a den-like environment, which dogs naturally love. Make sure the crate isn’t too large or too small. Your pup should be able to stand and turn around but not enough for them to have an elimination. These items are suggested but highly recommended on our new puppy checklist.